The Stale Seed Bed = a Weed-Free Garden | Gardens Alive! Q. My Significant Other and I are at odds when it comes to weeding—I am a weeder and he is not-though he thinks he is. I remove weeds down to the roots, and then loosely rake the area to loosen up any remaining roots I may have missed. My Better Half uses the "Grab and Yank" method, leaving many roots in the ground. Then he tosses what he rips out over the fence, scattering any seeds the weeds may have developed to regrow and blow back over into our garden. He insists they don't regenerate, and I don't see how they can't. Now, he is an avid composter, organic through and through and I love him dearly—but it has gotten to the point where we can't be in the yard at the same time while I'm weeding because he'll offer to 'help'. Mike: Pleeeeasssse set one or both of us straight on weeding! A. Well, as in most such disputes, the partner who sits down to pee is in the right. Some perennial weeds will regrow from even the tiniest of roots left in the ground; and his 'fence tossing' is like hiring the ghost of Johnny Appleseed to spread fresh chickweed in your yard every season. But your technique isn't perfect either. When you "rake the area to loosen up any remaining roots", you could be triggering dormant weeds seeds to sprout a week or two later. When pulling weeds, you should always soak the ground thoroughly, reach down low and pull gennnntly. Slow pulling from drenched soil gets all the roots out. But you've got the right basic idea, and he's a weed's best friend—so you get a B-Plus and he gets an F-minus. 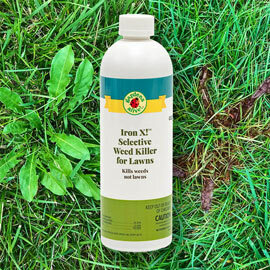 However, there is a much better way to deal with weeds—one that gets 90% of a full season's worth of unwanted plants out of the way early in the Spring, so that you can spend hot summer days pulling on a cold brew or a ceiling fan chain instead of dandelion roots. It's called the Stale Seed Bed technique, and it takes the worst aspect of tilling and turns it on its head. That's why I preach the Gospel of Raised Beds: When you grow in defined areas that are no wider than four feet (so you can reach the center of the bed without stepping into it) you won't have to step in the bed during the growing season, the soil won't become compacted and you won't have to till again—just add some fresh compost to the surface of the bed every season. And, when those beds are raised six inches to a foot above the surrounding surface, grassy weeds can't creep in from the sides. Then level out the growing areas and water them for twenty minutes every morning. After ten days to two weeks, all of the weed seeds you till-planted should be up and growing. Walking only in the lanes, use a razor sharp hoe to slice the baby weeds off at the soil line, being careful not to disturb the actual soil. Let the decapitated weeds lie there on the surface to decay, feed the soil and be a visible warning to other bad plants. Ideally, wait a few more days to see if any late bloomers emerge in the beds, and if they do, "off with their heads" as well. And that's it. Doesn't matter if the weeds were annuals or perennials; cutting they little heads off at that young an age does them in. You now have beds that are 'stale' of weed seeds—and a pull-free summer ahead.